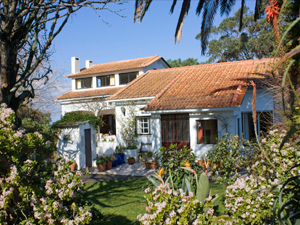 Colina flora is a comfortable "green" country guesthouse, with ocean views, peacefully located in the heart of the beautiful Sintra Natural Park - a walker´s paradise with walking trails starting at our gate. Amazing Adraga Beach (considered to be one of the 10 most beautiful beaches in Europe) is only 3 km away ( a beautiful walk downhill). Historic Sintra and Cascais are only 16 minutes away, 35 minutes to Lisbon and its international airport. English, German, French and Portuguese are spoken. Rooms have TV, internet, swimming pool, tea station.